I don’t expect I will ever need to engage the diff locks. Yes, I had forgotten about Big Red. Normally not interested in sand driving, I might make an exception in this instance. What pressure did you run through there Kevin? 14 psi. Doesn't take very long to get there from Birdsville; about 40Klm. There's Big Red and Little Red. It's a must do, as are curried camel pies from the Birdsville bakery! Looking for details regarding Big Red. Just how hard is it? I know where the pub and airfield is at Birdsville. How do you get to Big Red from there? Which is the easy climb, which is the hard climb? How do you know you are at the correct location? Anyone have gps co-ordinates? Any other information? I have done very very little sand driving. SG Forester 2.5 turbo with low range, dccd and rear locker. The only thingI know is that it has been done in an SVX. I'd post a picture but the last one was removed, for reasons I guess. It did it easily. I'm guessing up the easy track. At a guess, the power of that particular car is higher than your forester Fair bit of work done on that motor, N/A but ground celarance would probably be similar assuming you haven't lifted your forester. It's running a 6speed STI box with DCCD. don't think there's any other lockers. Not much help I know, but gives you an idea of what can go up it. Thanks for the info. Do you know what was done to the svx’s engine to increase it’s output and what power it has? Yes Big Red is a must! Watch the other 4wds for a bit. After you've finished chuckling, drop tyre pressures to 12-14psi, select 1st low, take it easy on the rutted section down the bottom then as soon as you're clear of the ruts, floor it! I believe you literally run into big red. 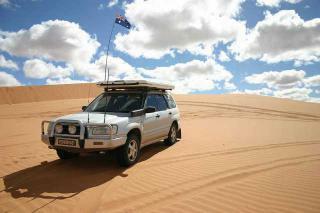 As for sand driving, always lower your tyre pressures. I start out at 20-25, then if having difficulty will go down to 15psi. In extreme cases 10psi then air back up after the difficult section is done. Just remember that the lower the pressure, the easier it is to roll the bead off the rim - so avoid hard cornering. You'll know if others are cruising on road pressures and 2wd as this leaves "little" sand dunes in the offending vehicle's tyre's path, kind of like corrugations. Not good for the track. Hopefully you won't find any big holes from a large 4wd maxing out their articulation while spinning wheels. Your foz should pretty much walk over anything out there I reckon. This is just opinion as I've not been out there yet. You won't need more power as my fully loaded Foz handled it. Floor it? Never done that off road before, at least not with this engine.